New York, NY (May 15, 2012) – Patricia Kaas announced today that she will bring her tribute performance for Edith Piaf to New York City’s famed Carnegie Hall on November 20th. Tickets go on sale this Friday, May 18 at 11:00 AM ET at www.carnegiehall.org. Although designed primarily as a live show, "Kaas chante Piaf" meaning "Kaas Sings Piaf" will also be released as an album. Revisiting the greatest hits of Edith Piaf, this album is central to Patricia Kaas' tribute to the great French singer. This major album, which will commemorate 50 years since the death of Edith Piaf, will be released on the 5th November 2012, just in time for the Christmas holidays. Some of the most evocative titles will be remixed by young French electro artists under the direction of Fabrice Brovelli and Christophe Caurret producers of Woodkid, The Shoes and Yuksek. "Kaas chante Piaf" is Patricia Kaas' new project, focusing on 21 of the great Edith Piaf's iconic titles, arranged by Abel Korzeniowski. The new wonder-boy of the Hollywood music scene, ever since his Golden Globe nomination for his work on Tom Ford's "A Single Man", Abel also composed the music for Madonna's W.E. This show, commemorating 50 years since the death of Piaf, will open at some of the world's most prestigious venues the Carnegie Hall in New-York, Royal Albert Hall in London, Olympia in Paris, Operetta Theatre in Moscow, Sejong Cultural Center in Seoul, etc. With innovative stage design, this unique show aims to be above all contemporary and urban. It will include a video installation with lighting that is different from anything on the stage today. Unedited, extraordinary, never seen images of Piaf will be the centerpiece of this unique event. Not only Charlotte just launched her new album IRM last week here in New York, but she will be the hero of the month at the French Institute Alliance Francaise where some of her most famous movies will be shown every Tuesdays night in February. The daughter of France's mythical couple, pop sensation and provocateur Serge Gainsbourg, and British actress and singer Jane Birkin, Charlotte Gainsbourg has shown both daring and creativity in her rise to the vanguard of France's cultural scene. A natural virtuoso by the age of twelve, her breakout role in Claude Miller's L'Effrontée earned her a first César award for "Most Promising Actress" in 1985. Since then, Gainsbourg has starred in over thirty critically-acclaimed films and has worked with prominent directors such as Agnès Varda, Franco Zeffirelli, Eric Rochant, Michel Gondry, and Todd Haynes, to name a few. Her film work has earned her countless César nominations, including Best Supporting Actress for La Bûche (1999), one of the films to be shown during the FIAF series. The fearless Gainsbourg's most provocative work yet as the grieving mother character in Lars von Trier's Antichrist (2009) won her the Best Actress award at the Cannes Film Festival this past May. Directed by Claude Miller, 1985. Color. 96 min. Winner of the Prix Louis-Delluc, L'Effrontée earned Gainsbourg the "Most Promising Actress" César for this, her first starring role. As a teenager in rural France, Charlotte (Gainsbourg) is frustrated and bored with home life. But a young pianist upends her world with talk of opportunity elsewhere, far from her family. Directed by Serge Gainsbourg, 1986. Color. 94 min. A rare, not-to-be-missed screening of this notorious and misunderstood film. Serge Gainsbourg wrote, directed, and starred in this dark and fascinating tale of a screenwriter grieving over his wife's unexpected death. Suicidal, he turns for affection to the only remaining link to his wife-his daughter. Mary-Jane (Birkin), a divorced mother of two, grows close to a teenage boy she met at her daughter's party. Through conversations, vacations, and video games, the pair's relationship evolves in a way that confuses their families and even themselves. Varda's empathetic direction anchors this delicate, but often powerful story. Singer, actress, Playbill Top 10 Diva and unabashed Francophile, Gay Marshall, reprises her enchanting Piaf concert at the Metropolitan Room. The show, PIAF: Queen of Heart, is based on Marshall’s 2008 recording, Gay Marshall Sings Piaf, La Vie l’Amour. Marshall, a Piaf historian, presents a unique view of her subject at odds with the popular perception of Piaf as an overwhelmingly tragic figure; Marshall portrays the joy and mischief of her subject as well. Marshall translated many of the show’s songs herself, and she has woven the repertoire in a way that makes it as accessible and meaningful for non-French speakers as others. Carla Bruni Sarkozy will be in concert in "live" on the stage for a duo with Dave Stewart (ex Eurythmics), for the 91st birthday of Nelson Mandela and for the first edition of the annual "Mandela Day". Aretha Franklin, Queen Latifah, Cyndi Lauper, the Soweto Gospel Choir, Stevie Wonder, Alicia Keys, T-Pain, Jesse Clegg, Gloria Gaynor...will participate to the show, in the benefit of aids care. For the second time in its history, New York will be celebrating the beginning of summer, Saturday June 21, with Make Music New York (MMNY), a city-wide festival of music held as part of the worldwide Fête de la Musique! First launched in France in 1982, la Fête de la Musique takes place on June 21, the day of the summer solstice, every year. During this one day, public spaces become informal musical stages for all alike, turning cities into festivals of live music-making. Close to 800 concerts are scheduled this year, with performers ranging from schoolchildren to marquee names such as Roy Hargrove, the principal brass of the New York Philharmonic, and singers from the New York City Opera. Make Music New York 2008 will also include more than a dozen block parties all-day music events on closed-off streets. In anticipation of the Guggenheim Museums full-career retrospective of Paris native and artist, Louise Bourgeois, Works & Process has scoured the streets of Paris to find the most talented performer to play some of her favorite songs. Paris Metro accordionist Francois Parisi will perform French children's songs, operettas and symphonies by composers such as Claude Debussy and Aaron Copland, jazz classics by Duke Ellington and Billie Holiday and French classics. The performance will take place on the Guggenheim Museum Sidewalk, Fifth Avenue at 88th Street  5:30pm. Carnegie Hall today announced that it will present acclaimed conductor William Christie and the early-music ensemble Les Arts Florissants on Thursday, April 3 at 7:30 p.m. in Zankel Hall. The performance features Charpentier’s Te Deum à 4 voix; Le reniement de St. Pierre; Magnificat, H. 73; Litanies de la vierge à 6 voix et 2 dessus de violes; and Lully’s Salve regina and Regina coeli. Singers and instrumentalists include sopranos Claire Debono and Ana Quintans, mezzo-soprano Isabelle Druet, haute-contre Paul Agnew, bass Jonathan Sells, violinists Ada Pesch and Florence Malgoire, and cellist David Simpson. This performance marks the Carnegie Hall debut of both William Christie and Les Arts Florissants. William Christie is a harpsichordist, conductor, musicologist, and teacher. His pioneering work has led to a renewed appreciation of Baroque music in France, most notably of 17th and 18th-century French repertoire, which he has introduced to a very wide audience. Born in Buffalo, NY, Mr. Christie studied at Harvard and Yale Universities, and has lived in France since 1971. 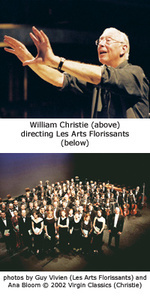 A major turning point in his career came in 1979 when he founded Les Arts Florissants. As Director of this vocal and instrumental ensemble, Mr. Christie soon made his mark as a musician and man of the theatre, in both the concert hall and the opera house, with new interpretations of largely neglected or forgotten early music repertoire. Tickets, priced at $56 and $62, are available at the Carnegie Hall Box Office, 154 West 57th Street. Tickets may also be charged to major credit cards by calling CarnegieCharge at 212-247-7800 or online by visiting www.carnegiehall.org . 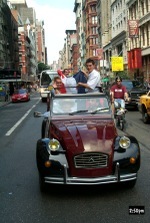 Eventhough, most of the French people living in NYC flee back to France for summer, you can still enjoy some very interesting French Events in town. Lincoln Center Festival 2007 will present La Comédie-Française, one of the world’s greatest theater companies, in the U.S. premiere of Les Fables de La Fontaine, directed by Robert Wilson. In Wilson’s visually striking interpretation, 19 of La Fontaine’s allegorical tales are brought to life by some of France’s finest actors. 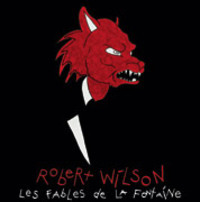 Wilson originally staged Les Fables de La Fontaine for performances at the Comédie-Française in 2004. When it was greeted with wide critical and public acclaim, the production was repeated in 2005. Featuring a company of 15 actors, Les Fables de La Fontaine revolves around the animal characters of the tales—lions, birds, foxes, and crows—with their parables of human behavior seen through the eyes of a 21st-century theatrical visionary. Performances: July 10, 11, 12, 13, 14 and 15, Gerald W. Lynch Theater. On July 14, France celebrates Bastille Day and commemorates the 1789 storming of the Bastille prison, which marked the beginning of the French Revolution. 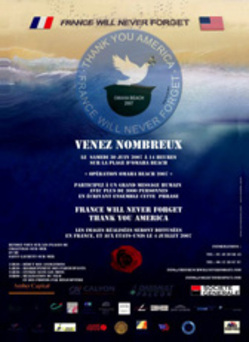 New York is joining in the celebration with some fun events for the whole family: petanque, pastis, accordeon, waiter's race, French Cancan...a Street Fair with French Flair organized by The Alliance Francaise and French Tuesdays.
. "France Will Never Forget"
On June 30th at Omaha Beach in Normandy, France, more than 3000 people will form a chain on the beach and write together on the sand "France will never forget. Thank you America"
Broadcast on TV on July 4th. For the first time after 8 years, Julien Clerc will perform in New York and will interpret his famous songs such as "Ma preference", "Femmes, je vous aime" and more recently "Double Enfance" and "Si j'etais elle". Since the 1960s, Julien Clerc has been one of the most popular singer-songwriters in the Francophone world. After 30 years years, he still enjoys immense popularity in France, his concerts attracting hundreds of his original fans as well as their children. Alternating between sad, sentimental songs and upbeat rhythmics numbers, Julien Clerc has always appeared to strike the perfect balance between finely-honed lyrics and populist melodies. Everybody remembers Carla Bruni as top-model in the nineties. But she has been singing for the last five years. And her music is worth discovering. After the success of "Quelqu'un m'a dit" in 2003, she just launched a new Album called "No Promises", sweet melodies pop folk, inspired by poems of William Buttler Yeats, Wystan Hugh Auden, Emily Dickinson, Christina Rossetti, Walter de la Mare and Dorothy Parker. The album just got imported in the US. Grand-daughter of a specialist of Wagner, daugher of the pianist Marysa Borini and of a rich industrial, director of the Teatro Reggio di Torino and compositor Alberto Bruni Tedeshi, Carla Bruni is born among the notes of music. Along the years, she developped her own way of composing her songs. She observes the printed form of the text, read the first sentence, try to find her own personnal resonance to it and start playing the guitar. "I am convinced that writing must let its place to the notes and vice-versa. One sentence, trois notes and I know if a song is there..."she says. 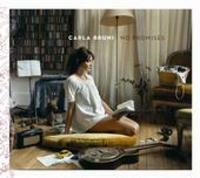 Carla Bruni is whispering "les choses de la Vie" (things of life) in a deep, sensual, sensuous voice. It is like spending a very intimate moment with Carla Bruni.